When you become a member of the Greater Starkville Development Partnership, you and your business or organization benefit in many ways. Some of the benefits are specific and tangible, like those described below. Other less obvious benefits derive from your support of the local economic community and those working to enhance it. Upon joining the Partnership, you automatically become a member of the Starkville Area Chamber of Commerce and are entitled to take advantage of the many programs offered. Payment processing is a critical ingredient in managing a successful business. Our cost savings partnership with First Data can help your business find the right solution at the right price while keeping your customers satisfied. Fast, convenient, and secure. With over 40 years of industry leading experience Express Merchant Processing Solutions (EMPS) powered by First Data helps millions of businesses like your bring safe, easy, cost-effective payments to their customers with affordable support-regardless of size. Services include payment processing, gift cards, Google Wallet solutions, personalized technical support, TeleCheck, enhanced reporting functions and much more. 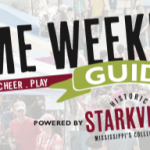 The Starkville Community Magazine and Membership Directory, published annually, is distributed to 5,000 members, businesses, hotel guests, visitors, and new residents annually, providing high visibility to potential customers. Partnership members are listed alphabetically and by classification. Members are also eligible to purchase display advertisting. The Chamber of Commerce Division offers many opportunities to publicize your business throughout the year through advertising and sponsorship packages. When you get the message out to fellow members, you’ll be reaching some of the region’s most influential leaders, including not only corporate managers, small business owners, entrepreneurs, and young professionals, but also media representatives, educators, and political and civic leaders who are Partnership members. The directory of members listed on the Partnership website provides worldwide exposure for your business. Upon request, links to members’ websites can be added to the Partnership website. The opening of a new, renovated, or expanded business provides an excellent opportunity for publicity. The Chamber of Commerce Division makes the necessary arrangements and invites key city and county officials and others to grand opening or ribbon cutting. After the event, publicity is provided in e-View, our weekly electronic newsletter, and photos are submitted to the local newspaper. The highly popular Business After Hours gathering, hosted by area businesses on the third Thursday of the first two months each quarter, offers an opportunity to showcase your firm and network with other members in an informal atmosphere. Partnership members are encouraged to invite prospective members as their guests. Get to know the Partnership team and other new members at one of these breakfast events, held once each quarter. Enjoy a Southern-style breakfast and an informal presentation about the Partnership structure and planning process. Many of the Partnership’s programs are designed and carried out by committees and task teams. Getting involved in an effort that matches your interests is a good way to meet fellow members and contribute to worthwhile efforts within the community. Member firms are given an opportunity to offer their goods and services at a discount to other Partnership members through this program, further stimulating local business. Member discounts are publicized in new member packets and on the Partnership website. When potential customers contact the Partnership office, our staff members refer them only to members of the Partnership. Capitalizing on the influx of new students each year, the Partnership provides packets containing coupons, brochures, and specialty promotional items supplied by members to more than 3,500 new students each year, helping your business gain their loyalty when they first arrive on campus. Partnership members stay informed about the latest business news and upcoming events via the Partnership’s weekly online newsletter, e-View. All members are welcome to submit articles about their businesses or organizations. Members may display their business cards and promotional materials in the Welcome Center at the Partnership’s offices on Main Street where they will be seen by hundreds of visitors each year. Only Partnership members may purchase a complete mailing list of nearly 500 Starkville-area businesses on preprinted labels or in the form of a spreadsheet so you can develop a database of prospects. The cost is only $35 for an Excel spreadsheet, which can be sent as an e-mail attachment, or $50 for a set of printed labels. Information on a wide range of business-related topics is available for members’ use at the Partnership offices. Data available include community demographics, local and area telephone directories, a community calendar, maps, lists of civic organizations and major employers, an industrial directory, and apartment guides. If you can’t find what you need, the Partnership staff will be glad to help. The cost of your Partnership membership is fully tax deductible as a necessary business expense. Partnership members and the community at large benefit from the Partnership’s varied programs. Learn more about the programs offered.